A nice and enjoyable stage in the middle of sand dunes in loop format like Stage 1, without liaison sections. The first and the last parts were the most complicated segment with some heavy dunes crossing. The rest of the route was composed by quick valleys with many traces where some good choices had to be made in terms of navigation. As the day before, the departure was planned in the center of the festival and the finish zone was situated at the entry area of the FB-Festival. 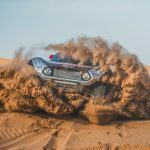 2017 China Auto Cross Country Championships and Dakar Series China Rally ended the second stage in Ālāshàn League, Inner Mongolia Region. The Knight Super Player Club’s Aorigele continued the previous day’s good momentum to win the championship. 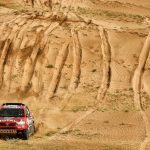 Toyota Gazoo racing South Africa’s Argentine driver Lucio Alvarez and Shaanxi Yunxiang, Auto & Motor Sports Co. Ltd. Liu Feilong are second and fifth respectively. The second stage is 129 km. Like yesterday, there are no ground road sections in the first half and the second half has large dunes, with the rest mainly canyon road. For drivers who can reduce mistakes in this stage, the results look good. In the afternoon there was some light rain which was an inconvenience, although it swept away the heat from the evening’s dust storm and brought the drivers a trace of cooler weather. 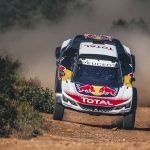 Aorigele, who has a home advantage, defeated the Toyota Gazoo racing South Africa Argentinean driver Alvarez with a 4-for-4 second advantage and increased his lead in the overall performance list. His team mate Qin Xu struggled with the day and was delayed for longer than five minutes. “It was a tough stage. I was trapped in the desert for nearly two minutes, but it was due to my own mistakes. 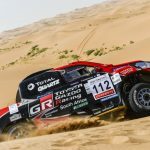 Fortunately, we are still doing well overall and today my team is not doing too badly after this result,” said Giniel de Villiers, the South African, the leader of the FIA class. Shaanxi Yunxiang Automobile and Motor Sports Co. Ltd., Liu Feilong and Zhang Ming were stable in first stage. Geely Auto Cooper Tire team Han Wei, Shanxi Yunxiang Motor Sport Co. Ltd. driver Zi Rong, and Jin Jing from Liqui Moly Xiongfeng team were ranked sixth to ninth. Han Wei: “De Villiers and Peterhansel are my idols. So today one of them is coming here and I am very happy to participate in the same race as him”. Today Xiangyang Modern City team driver Fan Tingjun gradually recovered the rhythm to have a great result in the top ten. After the drive he said it was not easy to take more time to adapt to the rhythm of the Rally. Wei Hongjie from Jiyuan Driving School team was also stable today. He also said that the new car will gradually increase in speed as they have the same technology as giant racing club driver Shen Weijian. He’s currently seventh with a time of 3 hours 56 minutes. Of course, one of the difficulties of this stage is to find the right place. For Zhengzhou Nissan Rui Qi team, how to rapidly increase speed while protecting the car has become a key issue. For the first time followers of the Rui Qi car gave it a high rating, and said that although the stage isn’t easy, the overall performance of the car stood the test. After the end of the two stages, Knight Super Player Club’s Aorigele is in the lead with a total time of 3 hours 27 minutes 03 seconds. 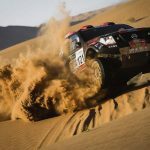 Toyota Gazoo racing South Africa, Giniel de Villiers and Lucio Alvarez are in second and third place with 3:32 and 3:35 respectively. Tomorrow, the September 26th drivers will usher in the third stage of the competition. 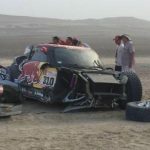 Latest : DAKAR – DRAMA ALREADY!